“The government… has landed us in a mess yet again”. UP TO TWO thousand people have gathered in Dublin’s city centre this evening to protest at Ireland’s abortion laws and call for a repeal of the controversial 8th Amendment of the Constitution. Protesters held signs saying “Raped, Pregnant, Suicidal, Forced C-Section – Ireland 2014,” and “I’m not a vessel”, in reference to comments made at the UN Human Rights Committee last month, where its chairman said Ireland’s abortion laws treat women who are raped as a vessel. The protest was called in response to the case publicised in recent days involving a suicidal young woman who sought an abortion after being raped. The demonstration was organised by a number of pro-choice groups, including Choice Ireland and the Abortion Rights campaign, who said that the aim of the protest was to demonstrate against “the horrendous treatment” of the woman. Michael McDermott, who attended the protest, said he was there because the treatment of the woman during her pregnancy was “disgraceful”, saying she was “basically tortured”. “It must have been overwhelming for her,” he told TheJournal.ie. “Women definitely need more protection, and it’s up to the State to protect its people and they’re really not following through with that duty”. Lisa Campion from Galway said it was her first protest. I’m one of these people who read in the newspapers all about this kind of stuff, but it just got to the point where I feel I have to come out and make a statement. It’s gotten to the point where we need to make sure that they know we’re not happy with the way things are going. Another protester, Heidi Folstrom, said she attended because “the issue of abortion rights is not as simple as just yes or not. It’s aboout rights for my body and the choices that I make [and] about how I’m treated in the hospitals”. She said abortion laws in Ireland were “antiquated and very dangerous”. Róisín, a 17-year-old protester, said she attended the protest because “everyone should have a choice”. “It’s not about if you actually ever get one [an abortion], it’s just that the option should be there”. Helen Stonehouse from Dublin said it was a “huge issue” for many people, and that Ireland is “still in the same place, still having the same discussions,” years after the X Case ruling. Richard Boyd Barrett told TheJournal.ie that he was at the protest because “this horrendous case shows that the legislation the government put through to deal with the issue of abortion has failed yet again”. “Women are still not given the right to choose, and it’s in the hands of doctors and other people, [and] you end up with a barbaric situation like this”. He said that repealing the 8th Amendment was the only way “to end this sort of disastrous crisis situation that women are finding themselves in”. “The government have in a very cowardly way made concessions all along the line to the anti-choice lobby. And this has landed us in a mess yet again”. He said he believed that putting the case to the Irish people in a referendum would lead to a change in the law. Gardaí confirmed that the turnout was between 1,500 and 2,000 people. Email “Hundreds of protesters turn out in Dublin over Ireland's abortion laws”. 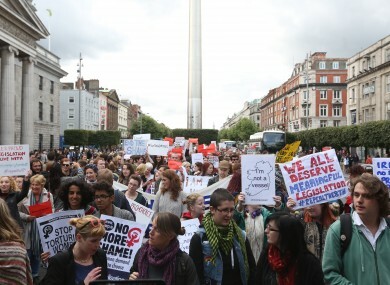 Feedback on “Hundreds of protesters turn out in Dublin over Ireland's abortion laws”.